This book was provided to me by the lovely people at Penguin Group Australia for review. 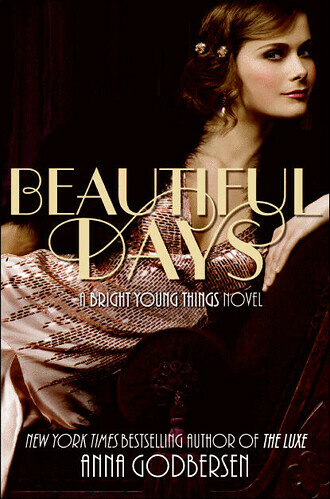 Beautiful Days is young adult fiction author Anna Godbersen's highly anticipated sequel to Bright Young Things. Set in the halcyon days of the Jazz Age in New York, the book follows the highs and lows of three beautiful young women living at Dogwood Mansion in the fictional White Cove, Long Island. Small town orphan Cordelia Grey, long lost daughter of the late Darius Grey, has inherited part of her daddy's bootlegging booze business and is living in the lap of luxury with her best friend from Ohio, Letty Larkspur. Letty is a talented singer on the brink of stardom and has moved in with Cordelia at the mansion until things pick up for her. Their good friend, wealthy socialite Astrid Donal, who is engaged to Cordelia's brother Charlie, lives in a neighbouring mansion and the three girls spend most of their days lounging by the pool or prettying themselves for the many evening soirees around Long Island and in Manhattan. As Cordelia and Charlie grieve recent the loss of their father, they decide to open their own speakeasy in Manhattan as a tribute to him and in an effort to push the Hales, a competing bootlegging family, out of the lucrative market. Tensions escalate though, as the rivalry between the Grey siblings and the Hale family increases, with each family taking dangerous steps to threaten and eliminate the other from the market. Astrid moves into Dogwood Mansion as her relationship with Charlie progresses, but quickly finds the goings-on of the business all together too dull for her liking, and recruits Cordelia, Letty and Billlie, her stepsister, to be part of her adventures on the town. This causes friction not only between Astrid and Charlie, and Cordelia and Charlie, but also between Letty and her new beau, promising writer Grady O'Dell. Cordelia also finds herself at odds with flirtation, unable to interpret the intentions of handsome, high-flying pilot Max Darby. As the opening of the Grey's speakeasy draws closer, each girl is pulled further into a world full of a seemingly never-ending cash supply, criminal activity, and unbelievably glamorous social circles where anything goes. As with the first book in this series, Anna Godbersen has created a richly layered 1920s world of money, mobsters and magic. The parties are endless, the fashion is to die for and the money never runs out. It's easy to forget that the three female characters are in their late teenage years, as the story offers them opportunities that seem to shimmer with possibility, and as they flit between Long Island and Manhattan, the reader is swept up in their glamorous lives from the first page. With deliciously detailed accounts of the minutiae of their daily lives, Godbersen shows her skill at building an exhilarating world full of possibility and intrigue, and teenage readers will be hopelessly captivated by the story. This book will appeal to older readers as well, as it has an almost Gossip Girl-esque premise. It's hard to believe any great tragedy could befall these girls as they enjoy the best days of their lives, so it will be interesting to see how they fare as 1929 draws to a close in subsequent books. I'm already desperate to read the next installment in the series, and I can't recommend this book, as well as its predcessor, highly enough. Beautiful Days is now available for sale in Australia for a retail price of approximately $19.95. I am glad you do book reviews because I love learning about new books. Thanks for this one. Anna, no worries. I love finding new reading material, and this series is just delightful! I'll probably have another one up next week too.